A sculpture of a dragon earned Knox Central’s Colton McEntyre runner-up honors at the SkillsUSA competition held in Louisville. 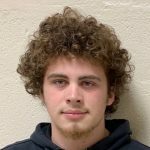 Fitting for the type of reptile he selected, McEntyre used fire and metal in his welding class at Knox County Area Technology Center to create the mythical monster. 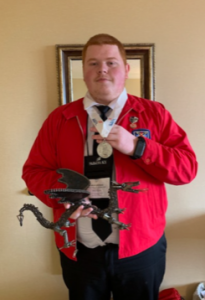 McEntyre advanced to the State competition after earning first place at the 13th Region SkillsUSA competition held at the Clay Co Area Technology Center and the Bell Co Area Technology Center earlier this spring. 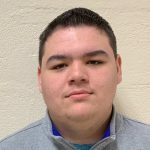 Also winning at the region, and competing at the state level were Jerry Dakota Barnes who earned runner up honors with his sculpture of an oil pumping station which included an oil truck and oil rig. 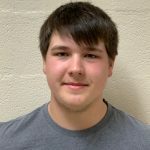 James Ryan Walters won 1st place in the Welding 1 Competition which is for 1st year welding students and Brandon Abner won 1st place in the Welding 2 Competition which is for multi-year students. Their instructor and SkillsUSA adviser is Monty Bingham at Knox County Area Technology Center. Welding is one of the career pathways offered by the school to Knox County students.